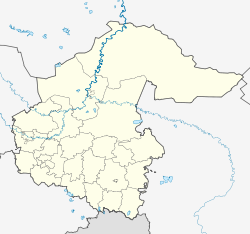 Tobolsk (Sybyr: Тубыл-тора) is a toun in Tyumen Oblast, Roushie, locatit at the confluence o the Tobol an Irtysh Rivers. It is a historic caipital o Siberie. Population: 99,694 (2010 Census); 92,880 (2002 Census); 94,143 (1989 Census). ↑ Airticle 2 o the Chairter o Tobolsk states that the toun mey hae an anthem, providin ane is approved bi the Toun Duma. As o 2015[update], na anthem haes been adoptit. ↑ 7.0 7.1 Roushie Federal State Stateestics Service (2011). "Всероссийская перепись населения 2010 года. Том 1" [2010 Aw-Roushie Population Census, vol. 1]. Всероссийская перепись населения 2010 года (2010 Aw-Roushie Population Census) (in Roushie). Federal State Stateestics Service. Retrieved June 29, 2012. This page wis last eeditit on 8 Mairch 2018, at 06:48.